TV producer Bill Lawrence, his daughter and witnesses described a tense few minutes as a plane came crashing into the East River. Ray Villeda reports. 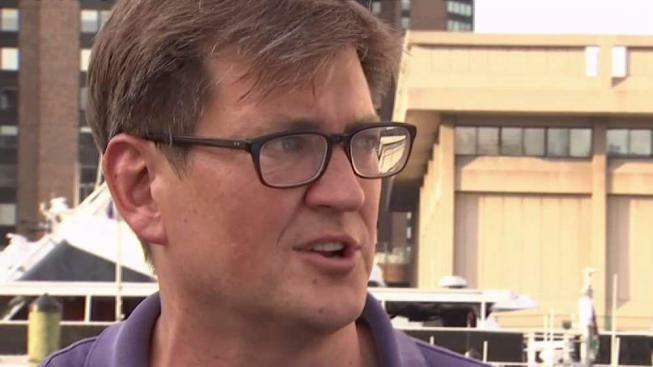 Ten people, including television producer Bill Lawrence of "Scrubs" and "Spin City" fame, were rescued from a seaplane after it made an emergency landing in the East River on Friday evening, officials said. An NYPD Harbor Unit boat picked up the ten people, who were wearing life vests and sitting in the plane after it went down in the water, FDNY Deputy Assistant Chief Michael Gala said. Among them were a pilot and nine passengers, including Lawrence, who described the plane as "our plane" in an Instagram post. Lawrence posted a video of himself aboard the plane as it landed in the river, along with photos of the other passengers, some of whom were sitting on the aircraft's pontoons as they waited to be rescued. "I don't like this," Lawrence can be heard saying in the video right before the plane hits the water. In the caption for the video, he wrote, "Just landing in the east river. No big deal." The video has since been deleted. Daughter is much more casual. Some of Lawrence's family members were with him on the plane. He wrote, "Daughter is much more casual" in a photo showing a group of passengers waiting to be rescued. In another photo after the rescue, he said, "Going to go drink tequila continuously. #Lucky"
Lawrence is known for creating, producing or writing a number of well-known shows, including "Scrubs," "Spin City," "Cougar Town," "Friends," and "Boy Meets World." With three struts broken, the aircraft began to list and the pilot aborted takeoff and made a hard landing in the water, according to officials. Television producer Bill Lawrence was among 10 people aboard a plane that made a hard landing in the East River on Friday evening. Michael George reports. "It just happened really quick, they tried to take off," Lawrence told News 4 New York. "They went up in the air a little bit, came down, pulled up, tried to go up in the air. When it came down, the flotation came off." "It felt like taking off, calm for a second, get nervous, come down — boom," he said. Lawrence's daughter, Charlotte, said it was a dramatic few minutes. "It was scary," she said. "Once we knew we were safe, it was fine, like I made a new friend. We were smiling eventually. It was scary initially." A woman named Kendall was also on the boat, she said she started crying. "I was just like shaking and really nervous, and once I got out I felt okay," she said. 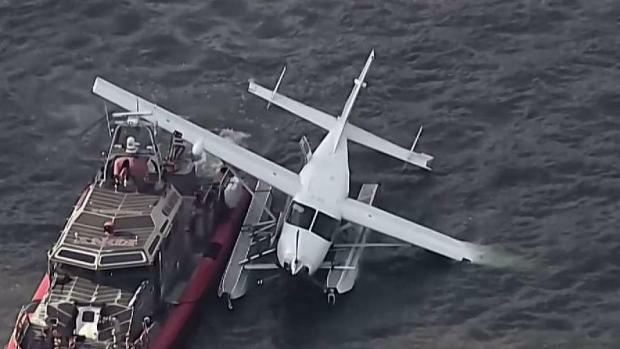 Seven people were rescued after a seaplane landed in the East River on Friday evening. Marc Santia reports. Bystanders recorded video and watched in shock as the plane came down. Carter Craft was on a boat after finishing up an environmental project when the seaplane made the hard landing and one of its pontoons broke. He said he saw the plane approach from the south, come in to land in choppy water and then come to a "dead stop." "I knew something was wrong when it was stalled there in the water," Craft said. "I could see it was completely stopped and there were a lot of people out on the wing and one of the pontoons that didn't break off." Leroy Farmer watched in horror as the plane splashed into the water. "When it hit the water, the left part made a front dive, like if a wave hit it," Farmer said. "It must have been about 15 people picking up the phone, dialing 911." FDNY Marine units and NYPD Harbor units responded about 300 yards from the East 23rd Street pier at 5:30 p.m., three minutes after the plane went down, officials said. FDNY units secured the vessel as NYPD units removed the 10 passengers, who were wearing life jackets and sitting in the plane. A plane made a hard landing in the East River on Friday evening. 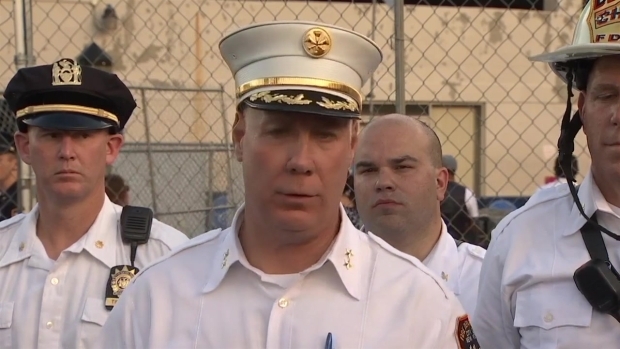 Officials from the NYPD and FDNY gave updates. Officials said all 10 passengers refused medical treatment after they were taken to SkyPort Marina. 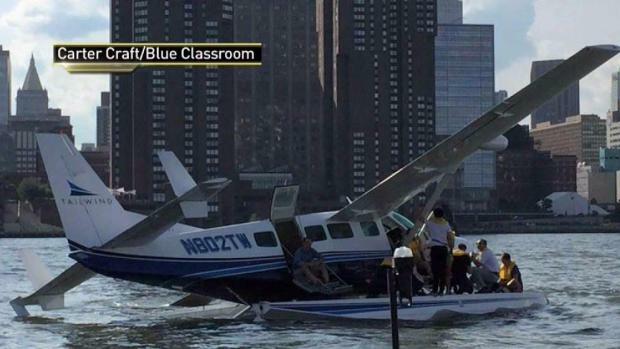 The rescue went so smoothly that NYPD Lt. Joe Grasso said the passengers weren't even wet. There was heavy traffic and delays on the FDR Drive as gawkers looked on at the plane during the height of the evening rush. As for Lawrence, he said he was taking it easy Friday night. "I'm going to go have a glass of tequila somewhere and sit around in the dark," he said. The NTSB is investigating what caused the plane to have trouble taking off, officials said. The Cessna Caravan C208 is registered to Tailwind Air, LLC, which provides shuttle service across the northeast and out to the Hamptons on Long Island, records show. Tailwind Air confirmed with News 4 New York that the plane was theirs. In a statement, the company's president, Shane Reynolds, said the passengers and crew were safe and that normal operations have resumed. This is the third unusual aircraft landing in the region in the past 36 hours. On Thursday, a small plane landed on Sunrise Highway on Long Island. And on Wednesday morning, a small helicopter carrying the only son of WWE owner and chairman Vince McMahon made a controlled emergency landing in the Atlantic Ocean off Long Island's Gilgo Beach, prompting a major emergency response.